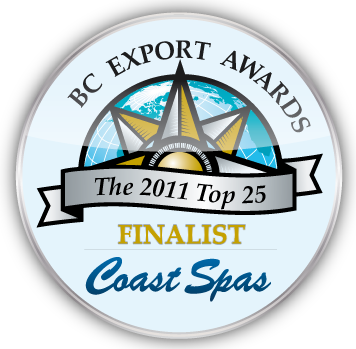 Coast Spas – Finalist for BC Export Awards! Today CME (Canadian Manufactures & Exporters) BC Division and the Ministry of Jobs and Tourism announced BC’s Top Exporters Award Finalist. “Coast Spas Manufacturing, Inc.”, The Coast Spas Group of Companies based in Langley BC, was chosen out of over 500 nominated BC businesses as one of three finalists in the “Consumer Products” category. The BC Export Awards is one of the longest running ceremonies of its kind in Canada and celebrates BC companies that make a positive impact in expanding the role of British Columbia in worldwide product and service exports. The Coast Spas Group is a first-class hot tub manufacturer and retailer that hand crafts high-end hot tubs, swim spas and spas at their worldwide head offices in Langley BC. Coast Spas’ retail store Coast Spas & Billiards in Surrey, BC is the largest single hot tub retail store in Canada and has held this distinction for many years. In addition to an extensive national retail network, Coast Spas exports their “proudly made in Canada” product to countries around the globe including the United States, France, United Kingdom, Ireland, Russia, Australia, Norway, Sweden, Denmark, Switzerland, Austria, Belgium, Germany, Israel, Czech Republic, Slovenia, Ukraine, Slovakia, Republic of Kazakhstan, Poland, Iceland, Italy, Netherlands, Egypt and Hungary. Coast Spas attributes their continued success and growth on the international level to their strict quality standards (ISO 9001:2008 Certification), numerous innovation patents and their family of skilled and devoted employees. “Canada is known all over the world for their hot tub craftsmanship, and we here at Coast Spas are so pleased to be a big part of ensuring and expanding on this honorable distinction” says Don Elkington President and CEO of Coast Spas Manufacturing. The winners for the BC Export Awards will be announced at the annual gala luncheon in the presence of BC’s top business leaders and government officials. The Awards Gala will take place Oct.28th at the Hyatt Regency in downtown Vancouver.